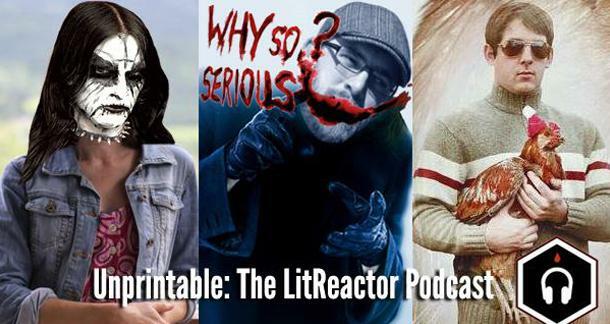 Every month, Unprintable will take an irreverent look at books, the publishing industry, reading, writing, and more; featuring the know-it-all geekery of LitReactor columnist Cath Murphy, Education Director Rob W. Hart, and Managing Editor Joshua Chaplinsky. The podcasters have returned from their respective vacations and are raring to go. Unfortunately one of the first orders of business is to discuss the sad news of Elmore Leonard's passing. Good thing Todd is such a fan and has some touching memories to share. We then move on to items of a silly nature with the Great Podcast Debacle of 2013, which is neither great nor a debacle. Mud slinging ensues. We also talk about LitReactor's tasty new book review format: Bookshots! Reads: Rob is reading YA?!?! Don't worry, he's also reading Crime. Josh finishes up Margaret Atwood's Maddaddam trilogy, and Cath speaks out about The Silent Wife. What is Todd reading? I forget. You'll have to listen to the cast. Topic: You think you've got publishing horror stories? You've got nothing on Todd Robinson, editor of Thuglit and author of The Hard Bounce. He went through five agents and four publishers before he came across someone in the business who wasn't a knucklehead, and it took almost ten years to get his first book published. Listen and learn, friends. His is a cautionary tale for the ages. As always, if you enjoy the episode, please rate us on iTunes, and if you're feeling extra specially generous, write us a short review. The few we've gotten so far have been great. They help us sleep at night! Any questions? Comments? Criticisms? Suggestions? Help us help you. Email them to podcast@litreactor.com. Cath Murphy writes for a bunch of literary and film websites (where “bunch” isn’t quite as many as it sounds), offering unwanted opinions on anything that appears in her crosshairs. She is a co-host of Unprintable: The Official Podcast of LitReactor.com, and along with the fabulous Eve Harvey she also podcasts very rude stuff on Sluttylemon. Rob W. Hart is the associate publisher for MysteriousPress.com. His short stories have appeared in Dogmatika, Needle: A Magazine of Noir, Crime Factory, and Shotgun Honey, and he is the author of The Last Safe Place: A Zombie Novella. He lives in New York City. You can find him on the interwebz at www.robwhart.com. Joshua Chaplinsky is the Managing Editor of LitReactor. He also writes for the popular film site Twitch and has written for ChuckPalahniuk.net. Special thanks to Gordon Highland for the intro and musical cues. Visit him at gordonhighland.com. No, your story with hummingbirds does not win. Ever. I had never even heard of Booked. or Books and Booze before this. If it makes anyone feel better, I've never heard of any of the podcasts listed in the article either. Come to think of it...I don't even remember how I found THIS website/podcast.